Before you scroll down the screen, promise me you won't laugh. Okay, now scroll. I'm sure you agree with me that the Jelliriffic! moulds are very versatile as proven by the participants of the Jellyriffic! challenge. Someone once said that there are no bad ideas, just bad marketing. I agree. More isn't necessarily more. When it comes to decorating and garnishing, I believe less is more. 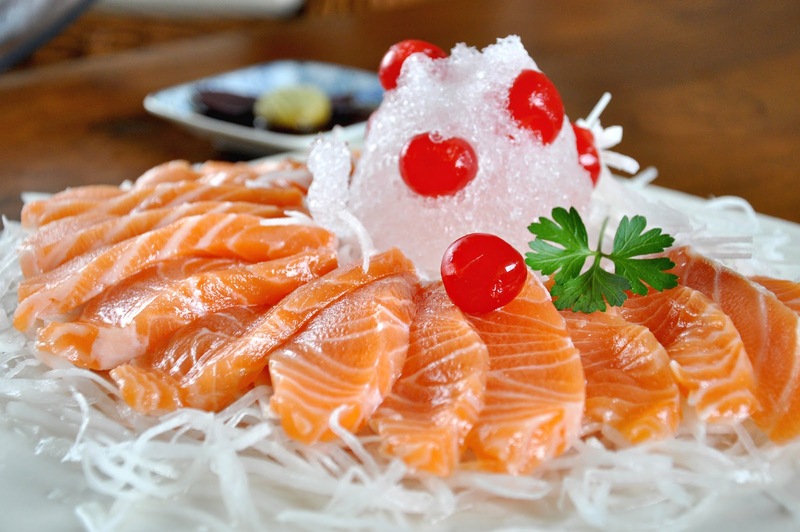 With that in mind, I mixed a handful of red maraschino cherries with some shaved ice and stuffed the ice into a Jellirific mould to make a decorative piece for a plate of salmon sashimi that I was serving for lunch today. The top fell off after a few minutes. It was a hot afternoon. This was much better, she said. Remember how people dissed IM Pei's Lourve Pyramid right after it was built? I was one of them. Now everybody wants to take a photo with their finger touching the tip. I did that too. I know what you are saying but hey, it's Sunday and this jelly thing has taken over my life and is more demanding than I expected. It's time to take a short break before I get cracking on making my best jelly yet with the Jelliriffic! moulds tomorrow. 1. 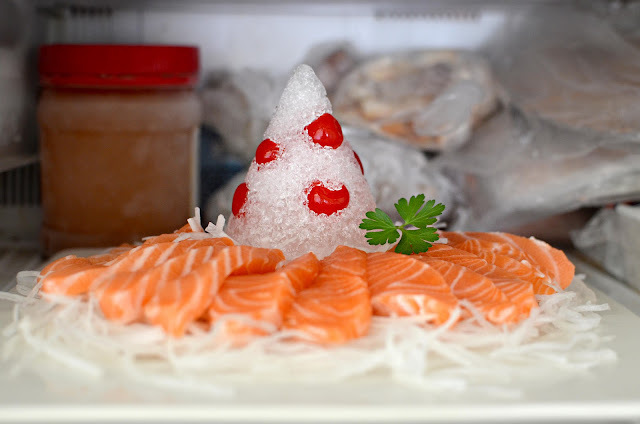 Fill a Jelliriffic mould with water and leave it to freeze. Make lots of ice cubes. 2. 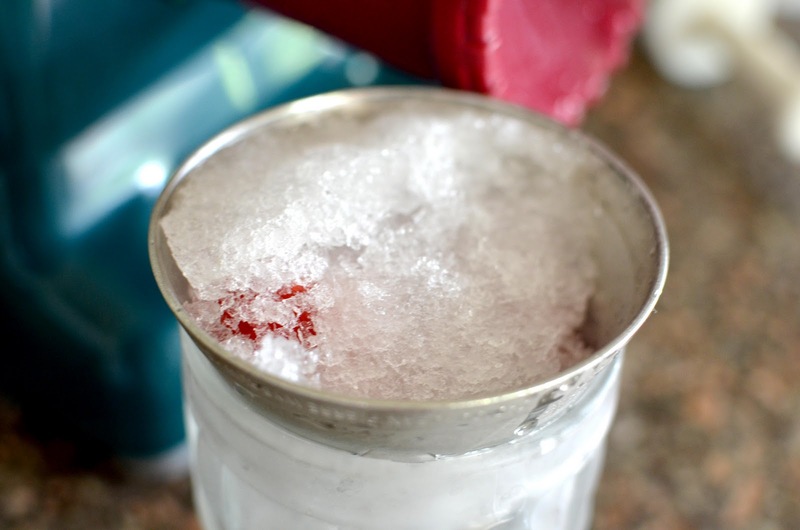 Borrow an ice shaving machine. Figure out how to put the parts together. Shave the ice cubes. 3. Pack the shaved ice and cherries into the Jellyriffic mould. Work quickly if weather is hot. In fact, if weather is hot, put the serving tray into the freezer and work there. 4. 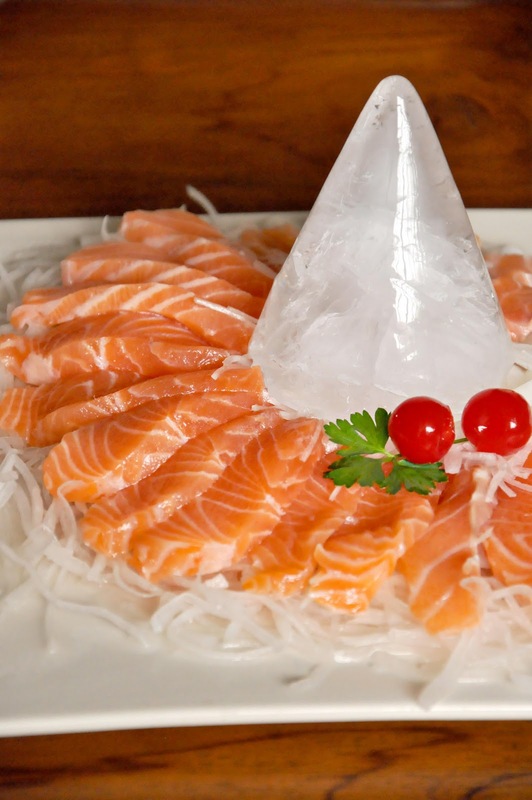 Unmould the cone of ice onto a ring of salmon sashimi and chilled julienned daikon strips. 5. When shaved ice cone has toppled, replace it with the solid ice cone. Eat quickly. haha, you are very cute! Hugs Terri. I hear you about how this Jelly challenge has taken over our life. Yums. 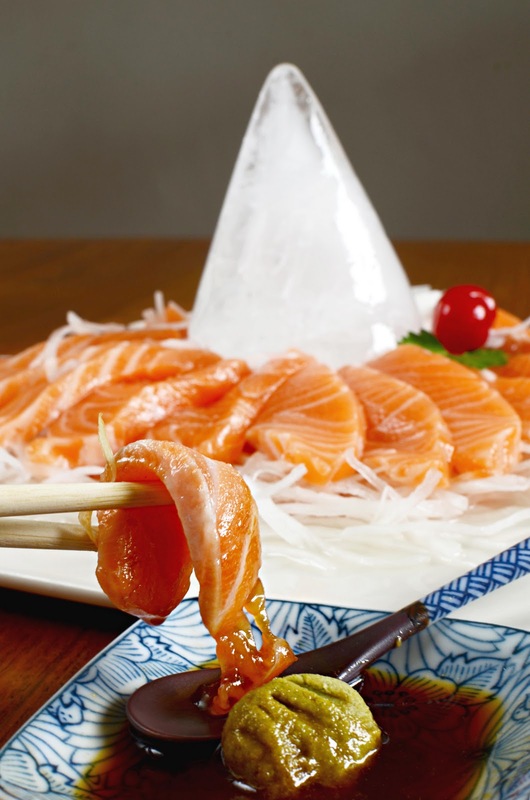 Salmon sashimi is my all time fav. 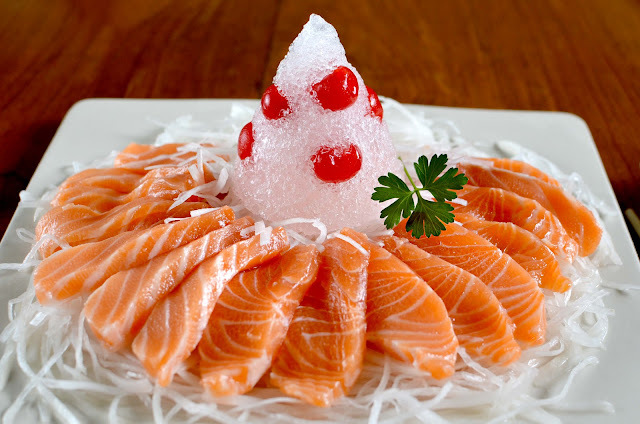 Hi Terri, was wondering where do you buy your fresh salmon sashimi in kk? All right, I laughed! :) couldn't help it, your words are so funny. I like the first photo with the bright green bit parsley tucked into the ice, like a flower in a snow-cone hat. "It really tied the room together." The moulds are great, aren't they? Very versatile indeed! Mmmm salmon sahimi! Can use ice cone for cold soba too, lol! I'm not laughing. Instead, i am standing at attention, giving you a salute for being so innovative and for thinking out of the box. You deserve to win this competition because you work so hard at this. Bravo! oh dear..the salmon look so fresh and delish..good idea!! You deserve to win cos you can make simple n complex stuff with the mould! You're the one who's breaking the mould! I salute you for being so gutsy to do something so simple...but hey I think it turned out beautiful! Another example of less is more! Hahaha, good laugh! Just know that you can also so cute . Nice presentation thought. LOL! maybe lemon slices would've been more suitable instead of cherries, just a thought. been following your jellirific challenge, you're doing great! gosh, 3 more weeks to go... if i'm u i'd be brain dead by now! can't wait to see what else u come up with. here's a suggestion, how about making 7 layer kueh, or kuih talam with the moulds? unmoulding would be quite tricky though. anyway, good luck to u! This is such a hilarious post! I couldn't stop chuckling. Sorry! you always have great ideas.blogging your blog daily like new love. Well, you DO need a break from all that jelly making. So, it's alright to KISS!